From Washington DC, Sharon is also a flautist and keyboardist. The piano was her first instrument. From this start, she began playing drums, the flute, and ended with the sax. She began playing sax in high school and said "believe it or not I wanted to hang out with the sax players after hearing Grover Washington and several funk songs that had horn sections". She started a career in computers as a programmer and a web designer, but after being laid off several times due to riffs, realized that she had the sax to fall back on. She says "its a struggle, but I love performing and touching others through my music and I have been doing it full time as a career for 4 years. Since starting her musical career, Sharon has jammed with a number of well-known bands. More recently she has been performing locally with the band "Uncharted Waters", which features flautist Arch Thompson. Her band, The Sharon Thomas Experience, has performed with Ginuwine, Ralph Tresvant, Dawn Robinson of EnVogue, Mr. Cheeks, Tony Terry, and Teena Marie just to name a few. Sharon is committed to her musical journey and to sharing her musical talents with the world. Sharon can be seen and heard performing at numerous venues in the DC area. Sharon Thomas' "Same Ole Love"
“Sharon Thomas is a multi-instrumentalist who plays keyboards, drums, flute, and, her favorite, the saxophone. 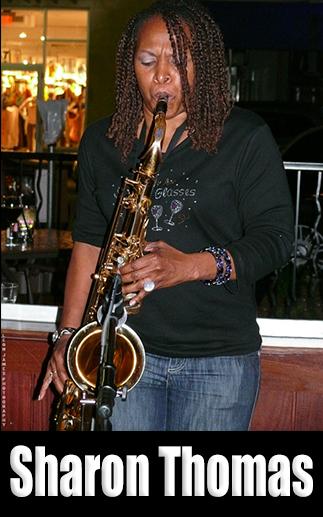 This Washingtonian, who stands at 5 feet, even plays a big tenor sax that comes to her knees. In her words, “she likes big things.” Her band, the Sharon Thomas Experience, gives you a nice mix of straight-ahead, smooth jazz, r&b, and even a little funk. One minute she was playing Grover Washington’s “Mr. Magic” and segued into Manu Dabango’s “Soul Makossa”– needless to say by this time she was rocking the house. Thomas has been invited to perform with nationally established recording artists on national TV shows like The Arsenio Hall Show. She’s played with Tony Terry, Ginuwine, and even Funkedelic."